An immersive, three-stage digital program that includes a first-ever, pro-social Facebook connect experience, a TakePart series highlighting everyday changemakers and a toolkit for community action. Inspired by Focus Features and Participant Media's Promised Land, Participant's Social Action campaign, "Champion Community Change," propels individuals to create change in their communities through an immersive, three-stage digital program that includes a first-ever, pro-social Facebook connect experience, a TakePart series highlighting everyday changemakers and a toolkit for community action. The campaign launches tomorrow, January 4, at takepart.com/promisedland to coincide with the film's national release. In a first-ever, pro-social Facebook Connect experience, Participant Media puts individuals in the shoes of a changemaker, tracking their personal journey of identifying a local issue by leveraging social media with the help of their friends to create real change in their communities and being celebrated through hero-like coverage. TakePart's Changemakers Series highlights the stories of everyday people who are taking small steps to create big change in communities all over the country, including Mama Hill, who started a home learning center for youth living in South Central Los Angeles; Alabama Chanin, who helped to revive her small town by starting a home-sewn apparel line that attracted the attention of some of today's biggest fashion labels; Malik Yakini, who started an urban farm in Detroit when his community hit a downturn; and Ruth Lande Shuman, an architect/designer who is putting her skills to use in reimagining New York City classrooms with color. Finally, a community action toolkit provides information about and links to all of the digital platforms that exist to heighten community engagement and involvement, with versions for both citizens and elected officials. Chad Boettcher, Participant's Executive Vice President of Social Action & Advocacy, said, "In Promised Land, the arrival of Matt Damon's salesman character in a small town dramatizes a situation taking place all over America today in which communities, facing difficult decisions, are forced to come together to collectively determine their futures. Yet, through research we know that there's a large number of Americans who would like to participate in organized community work, but don't know how or where to start. In an independent study commissioned by TakePart, 84% of cause-interested adults said they wished they could do more, and 69% said that they wish it were easier to get involved. Our Social Action campaign is designed to give people the virtual experience of what it's like to be a community changemaker, along with the resources they need to get started in their home towns." In assembling the various tools for the campaign, Participant has brought together a broad consortium of associates, including MindMixer, which allows citizens to provide valuable input on important community decisions; POPVOX, which enables individuals to sound off with their elected officials in Congress -- and see in real time what others in their community are saying; and All for Good, an open source search engine powered by the largest database of in-person and volunteer opportunities on the internet. Nick Bowden, Co-Founder of MindMixer said, "MindMixer is very proud to be associated with Participant's Social Action program for Promised Land, which has organized the tools for public engagement into a user-friendly package so that anyone can take an active role." Added Rachna Choudhry, Founder of POPVOX, "The POPVOX team is excited to be part of the Promised Land Social Action campaign. As the movie shows so effectively, a single voice can change the public discourse. POPVOX can provide citizens with the awareness of whether they've reached a critical mass on a community issue information which can move mountains when people know they're speaking as one." "When people are inspired to get involved as they will be after seeing Promised Land that first step needs to be an easy and meaningful one," said Michelle Nunn, CEO of Points of Light, the largest organization in the world dedicated to volunteer service. 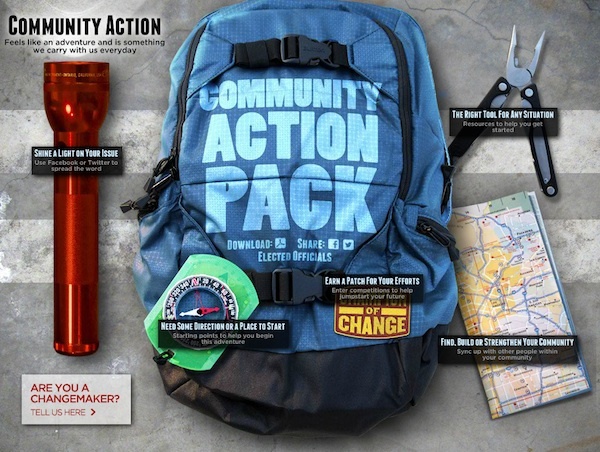 "With its link to All for Good, Participant Media's terrific toolkit provides a great first step and stop -- for people who want to build strong communities through volunteer service." In Promised Land, which Focus Features releases nationwide tomorrow, January 4, Matt Damon stars as Steve Butler, a corporate salesman whose journey from farm boy to big-time player takes an unexpected detour when he lands in a small town, where he grapples with a surprising array of both open hearts and closed doors. Gus Van Sant helms the film from an original screenplay written by John Krasinski & Matt Damon, from a story by Dave Eggers. Promised Land is MPAA-rated "R" (for language). Participant Media (participantmedia.com) is an entertainment company that focuses on documentary and non-documentary feature films, television, publishing and digital content about the real issues that shape our lives. For each of its projects, Participant creates social action and advocacy programs to transform the impact of the media experience into individual and community action. Participant's online division and Social Action Network is TakePart (takepart.com). Founded by Jeff Skoll in 2004, Jim Berk serves as CEO. Participant's films include The Kite Runner, Charlie Wilson's War, An Inconvenient Truth, Good Night, and Good Luck, The Visitor, Food, Inc., The Cove, The Crazies, Countdown to Zero, Waiting for "Superman," Fair Game, PAGE ONE: Inside The New York Times, The Help, Contagion, The Best Exotic Marigold Hotel, Middle of Nowhere, Lincoln and Promised Land. Focus Features and Focus Features International (focusfeatures.com) comprise a singular global company. This worldwide studio makes original and daring films that challenge the mainstream to embrace and enjoy voices and visions from around the world that deliver global commercial success. The company operates as Focus Features in North America, and as Focus Features International (FFI) in the rest of the world. Focus Features and Focus Features International are part of NBCUniversal, one of the world's leading media and entertainment companies in the development, production, and marketing of entertainment, news, and information to a global audience. NBCUniversal owns and operates a valuable portfolio of news and entertainment television networks, a premier motion picture company, significant television production operations, a leading television stations group, and world- renowned theme parks. Comcast Corporation owns a controlling 51% interest in NBCUniversal, with GE holding a 49% stake.